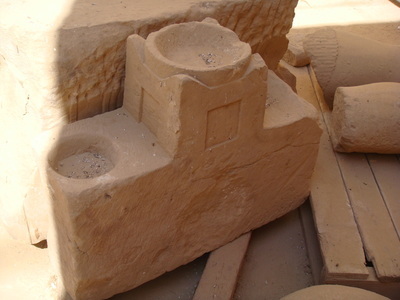 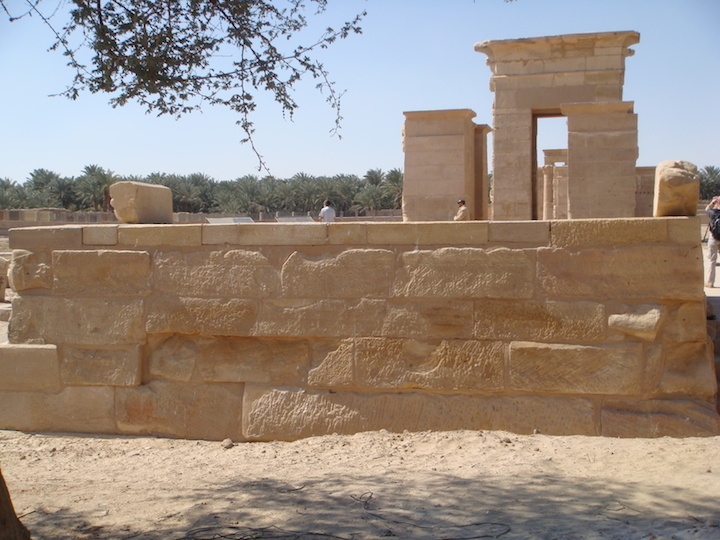 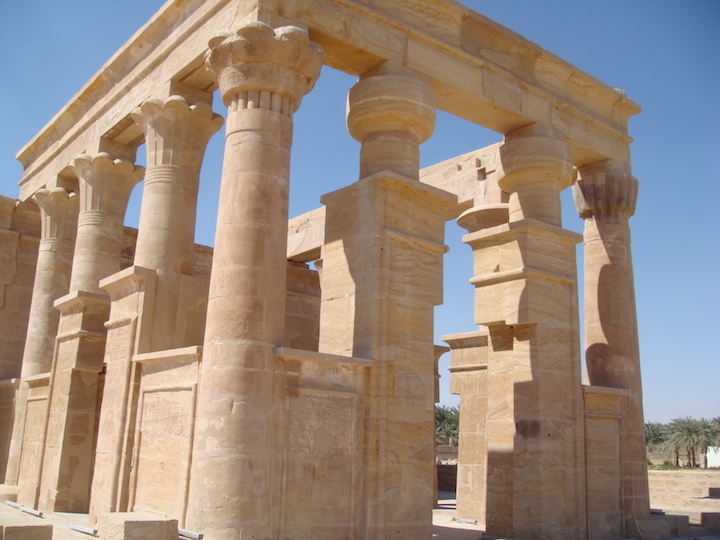 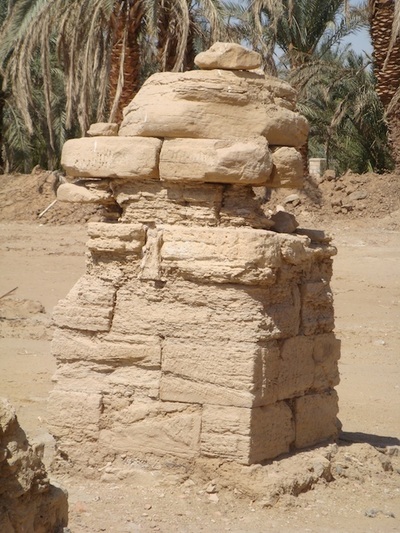 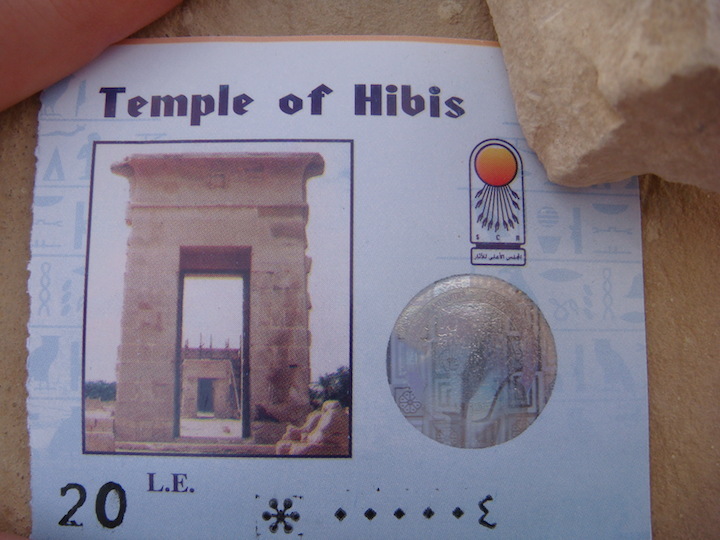 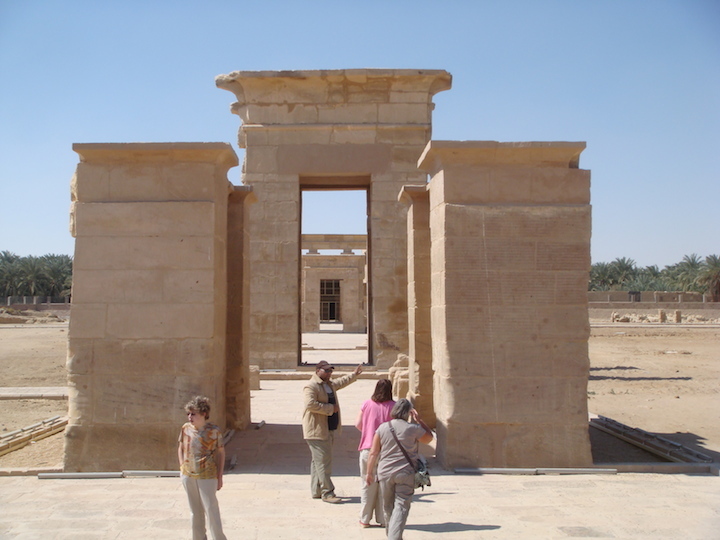 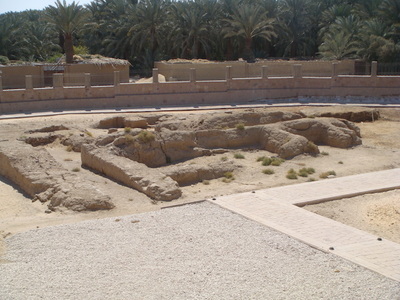 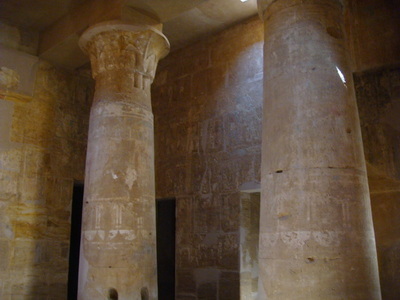 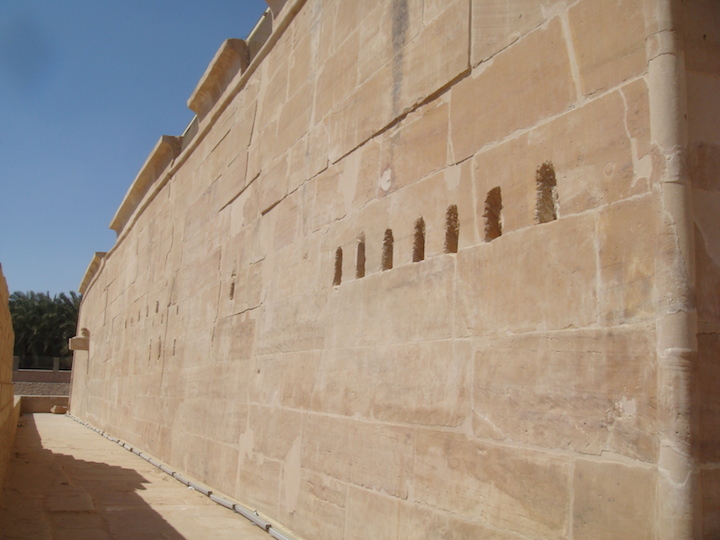 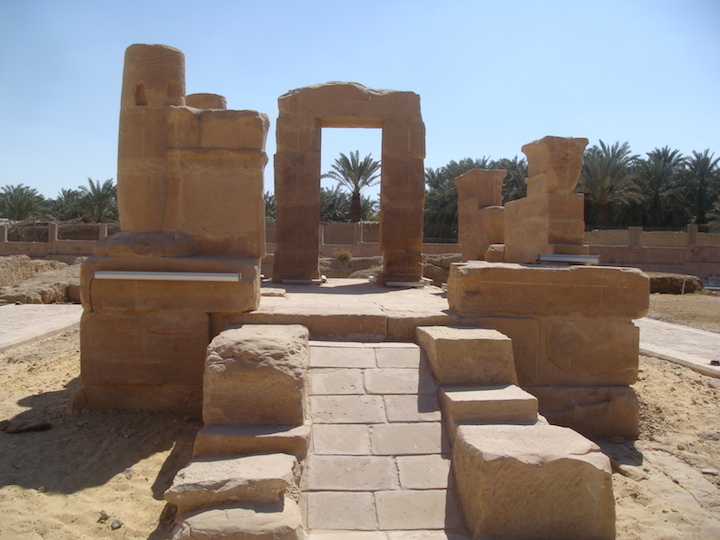 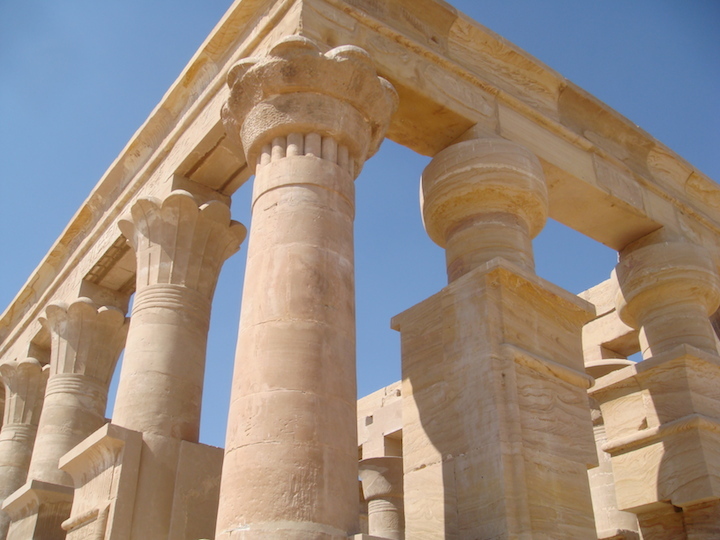 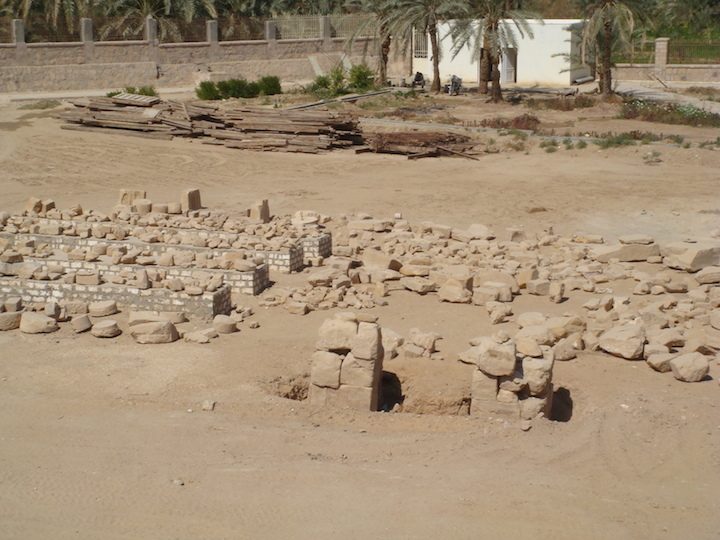 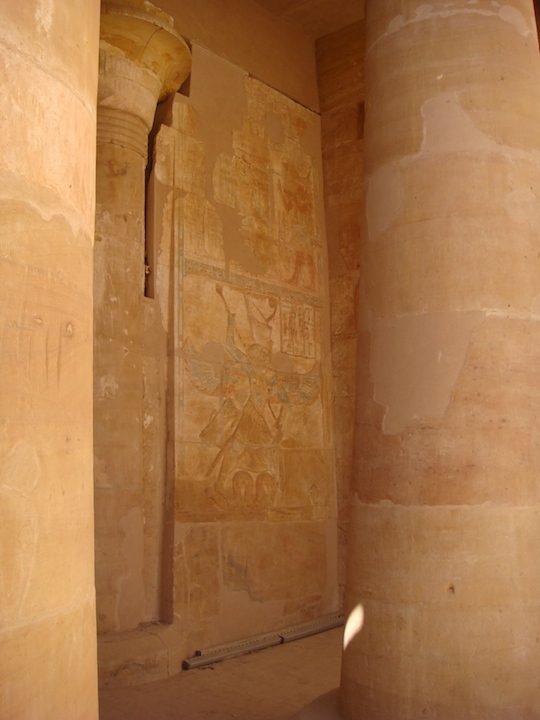 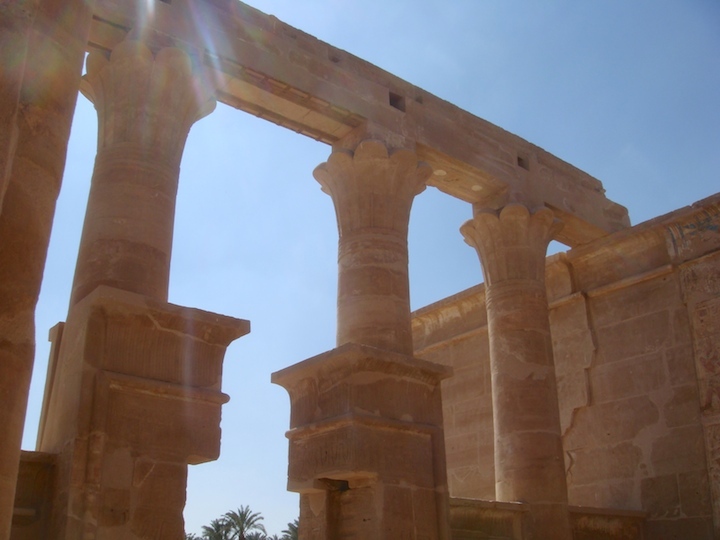 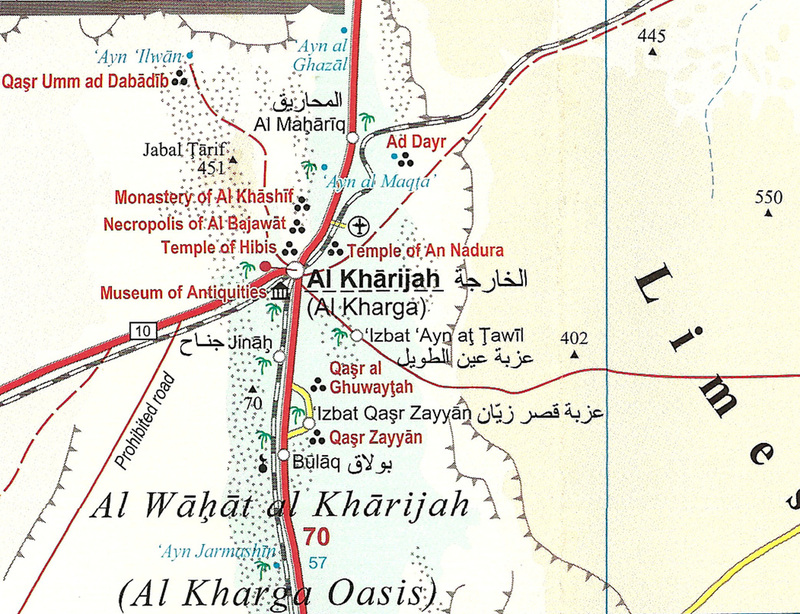 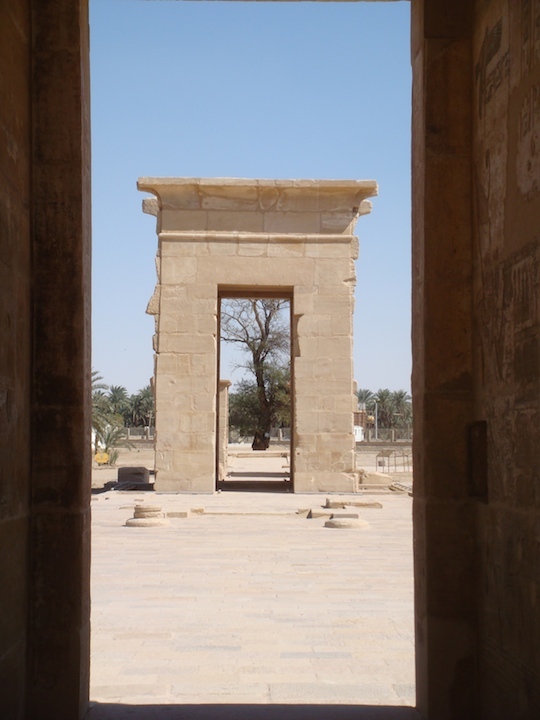 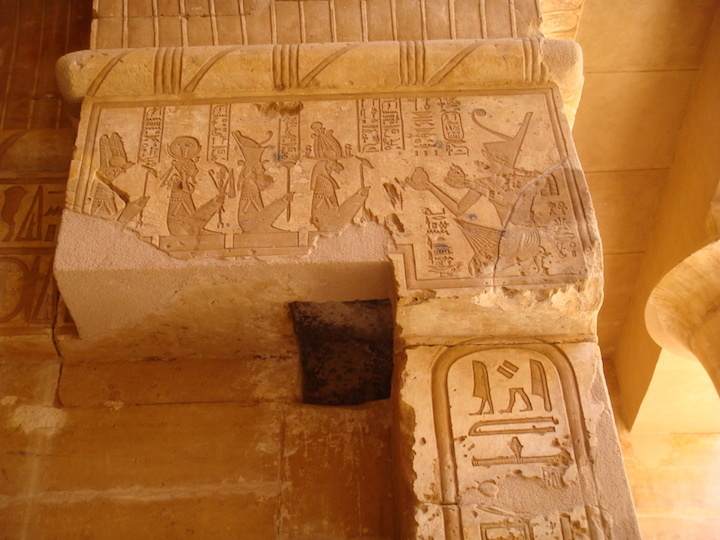 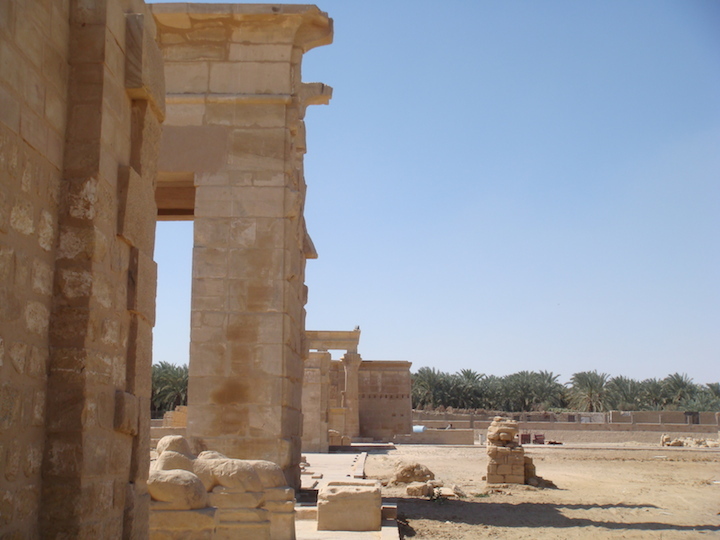 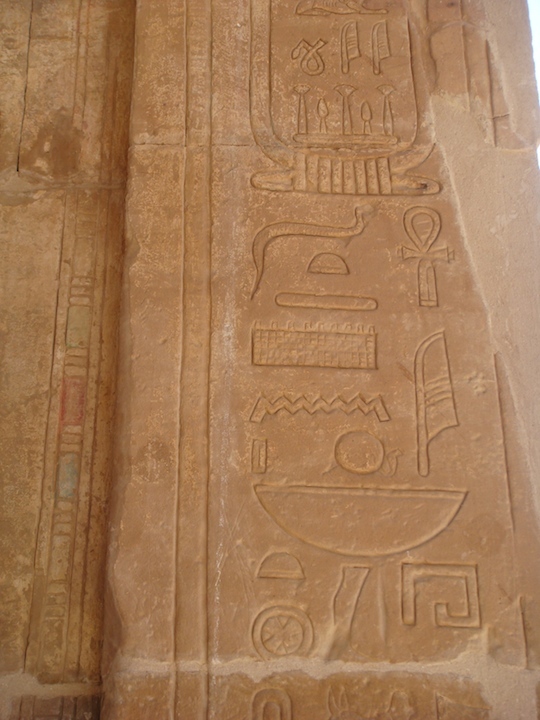 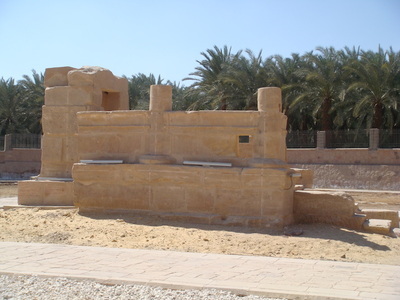 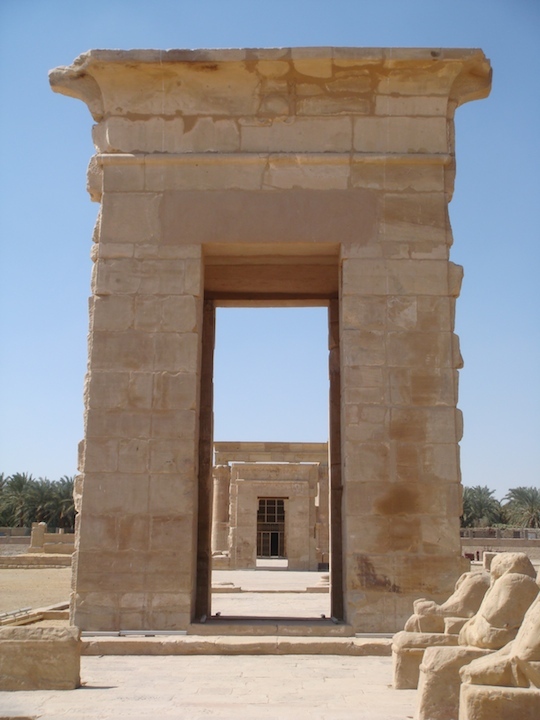 The Temple of Hibis is the largest and most well preserved temple in Kharga Oasis. 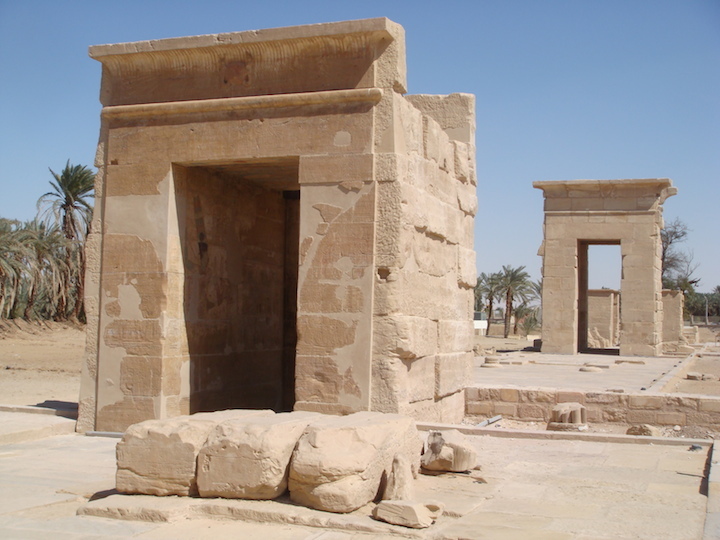 It is also the finest temple from the Persian period in Egypt, probably because it was buried in sand until the excavators dug it out early during the twentieth century. 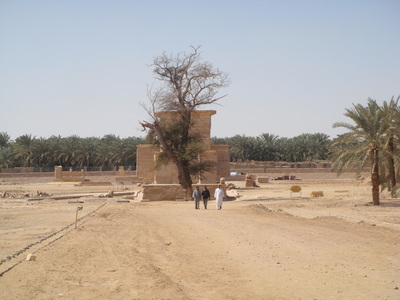 The name Hibis is the Hellenized version of the ancient Egyptian toponym Hebet, apparently meaning “place of ploughing” or “Town of the Plough” was the garrisoned capital of the oasis. 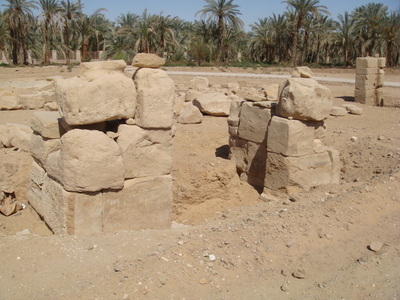 It lay in the valley of Gebels al-Teir and Nadura. 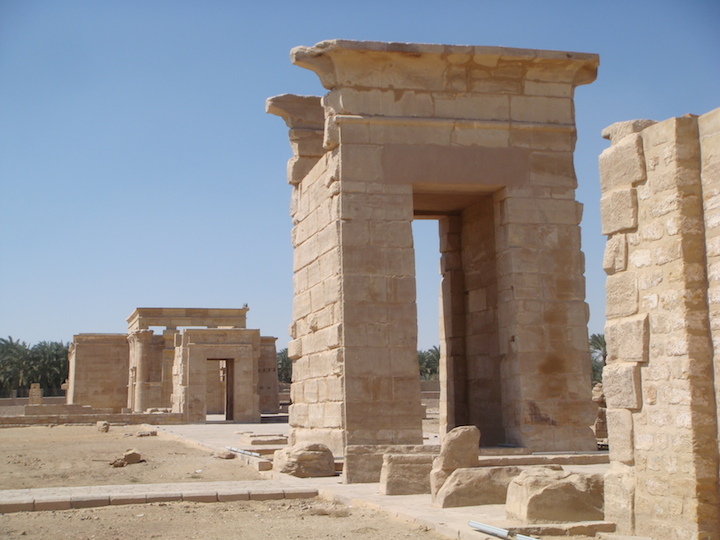 And is located just over two kilometres north of the modern city of Kharga. 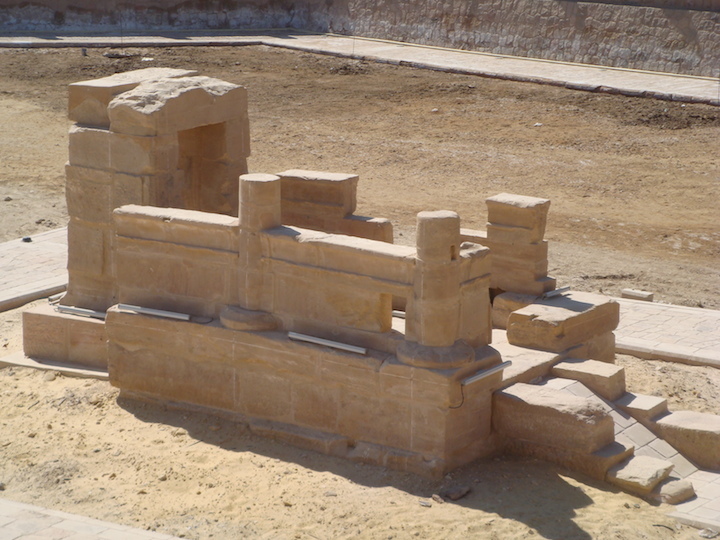 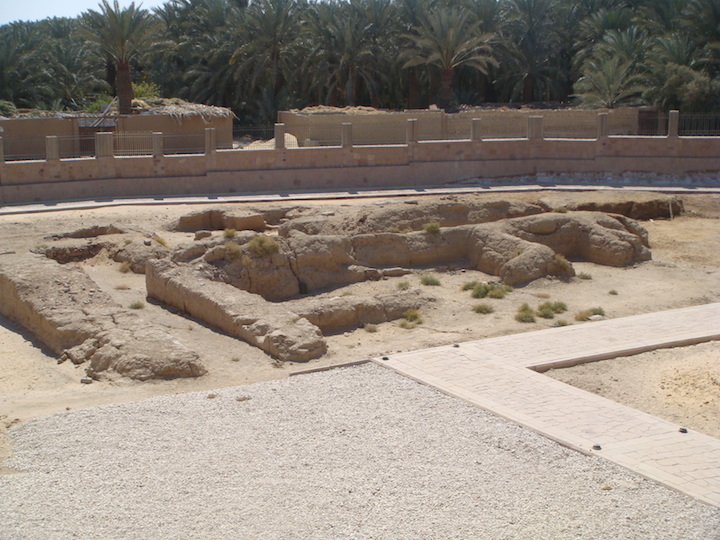 Although construction of the present temple may have began as early as the 26th Dynasty (664-525 BCE), Hibis Temple in its present form dates to the reign of the Persian Pharaoh Darius I (27th Dynasty (521-486 BCE), with additions, including the forecourt, commissioned by the 13th Dynasty rulers Nectanebo I (380-363 BCE) and Nectanebo II (360-343 BCE). 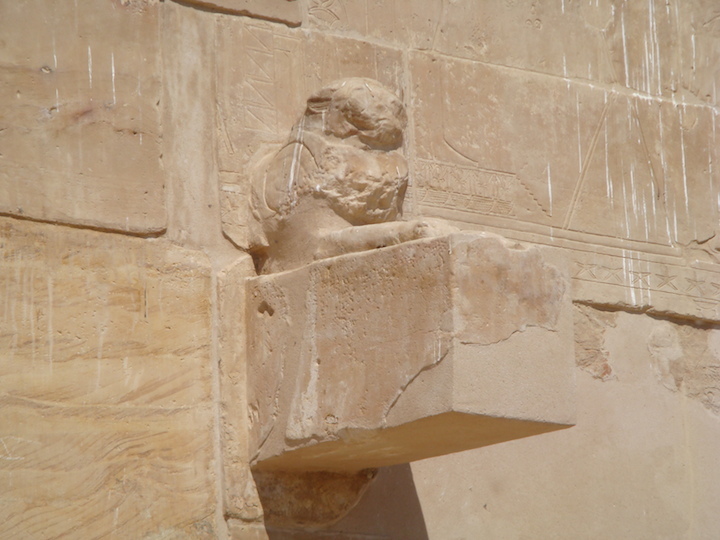 Further additions and enlargements date to the Ptolemaic Period and include a sphinx-lined avenue and gateway. A mammisi is located southwest of the temple. 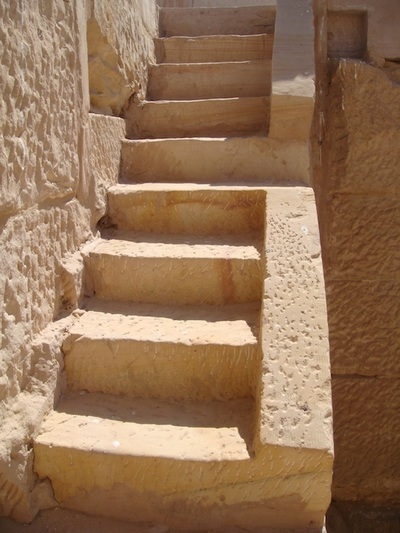 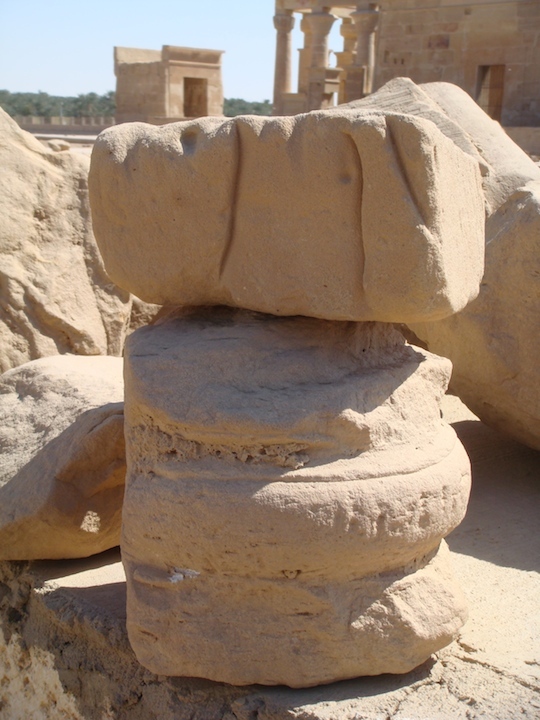 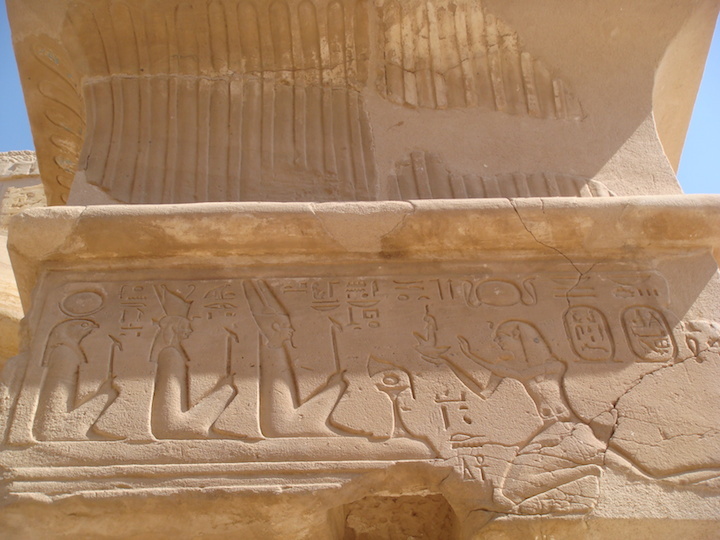 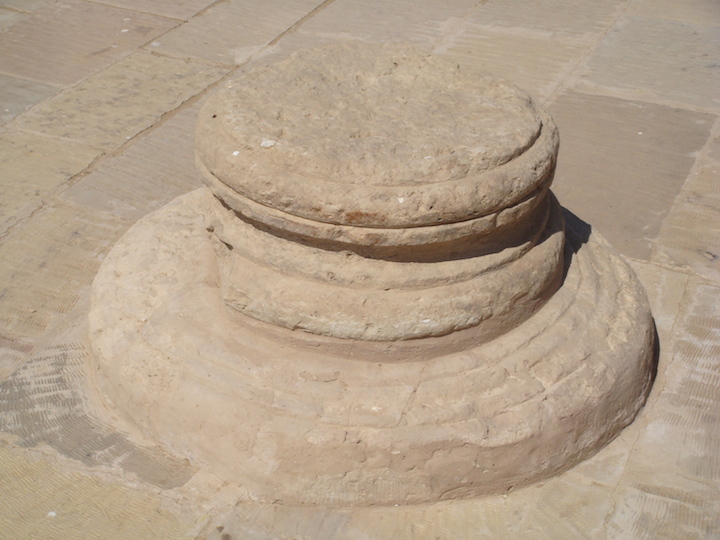 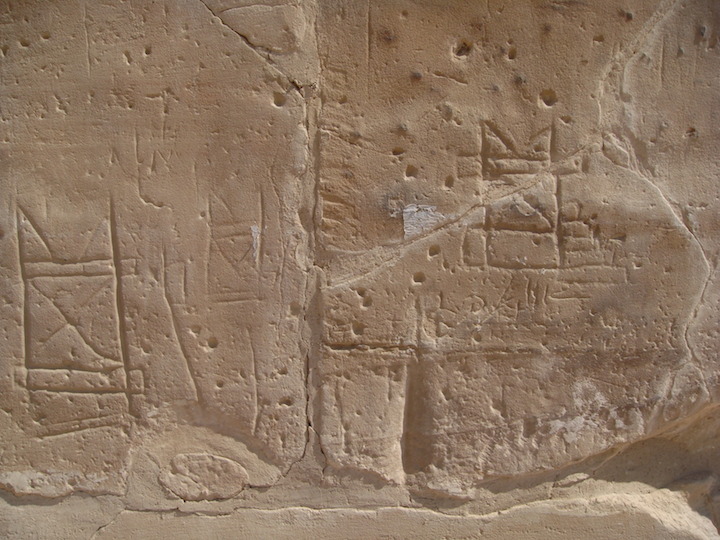 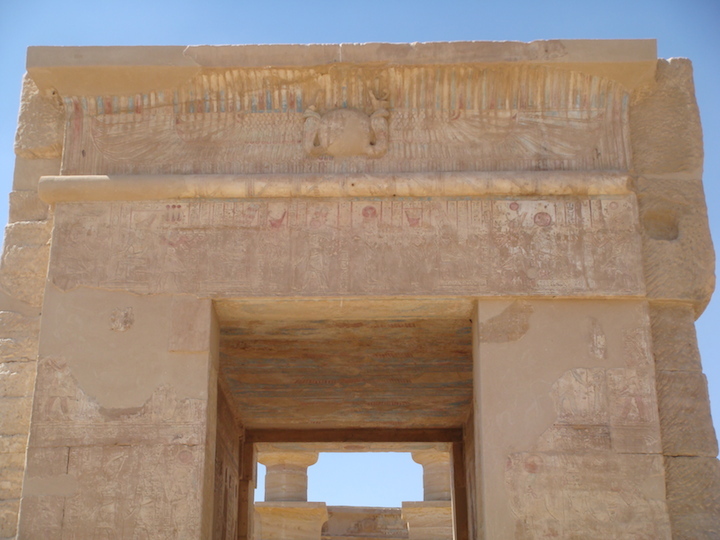 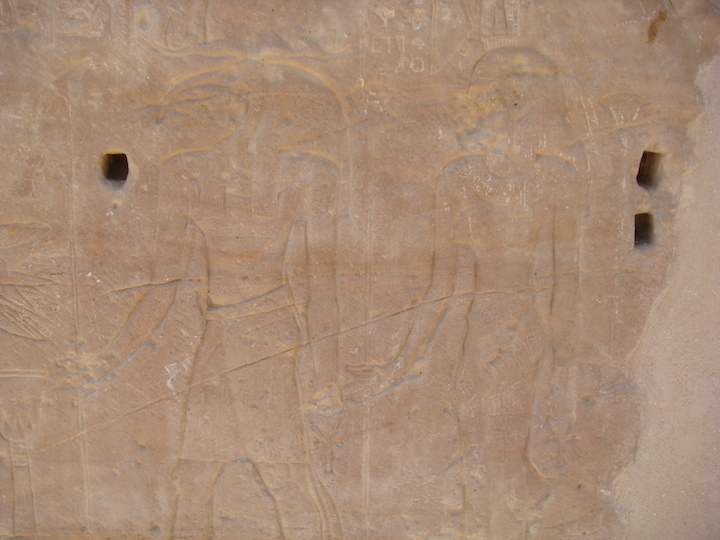 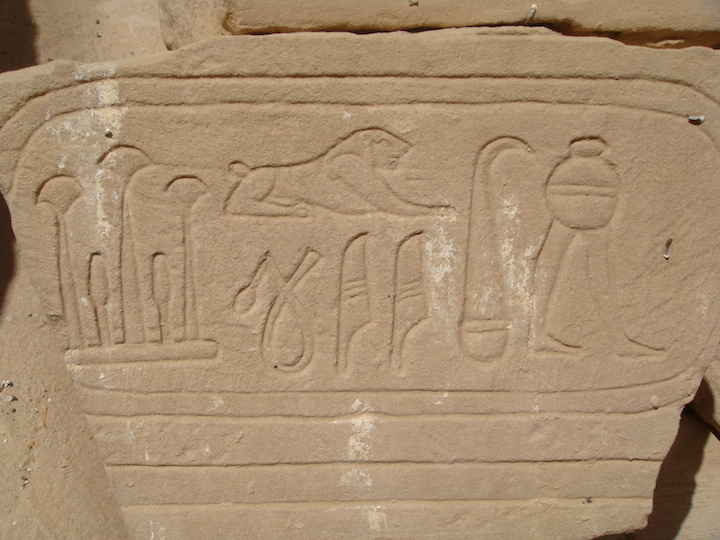 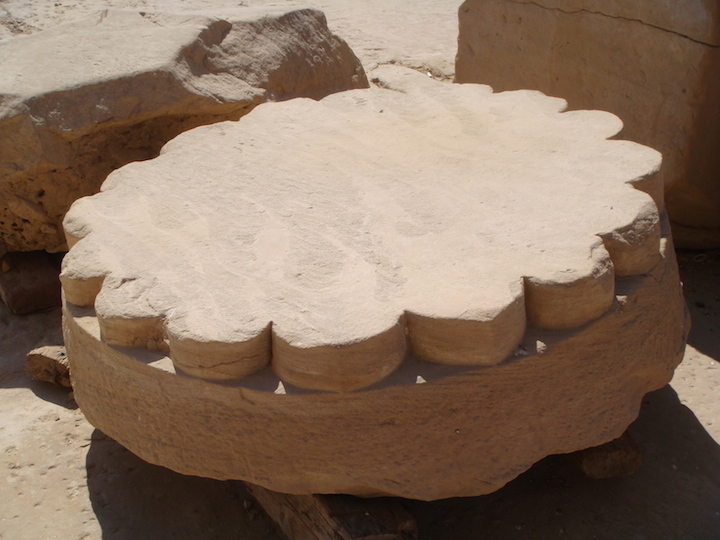 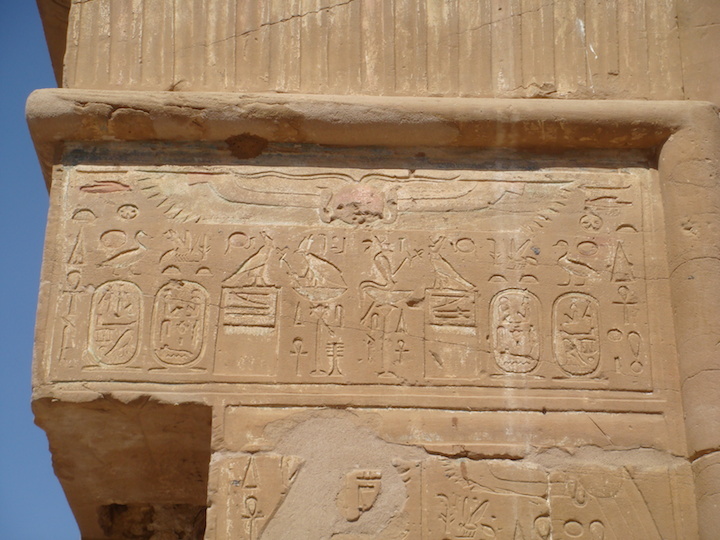 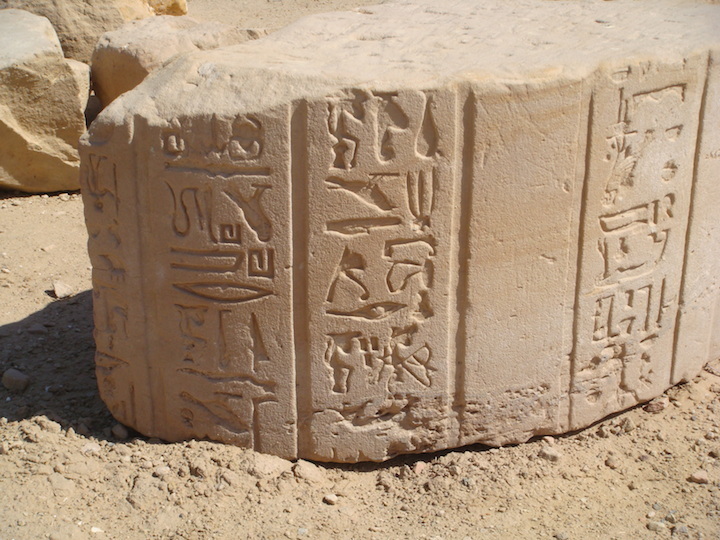 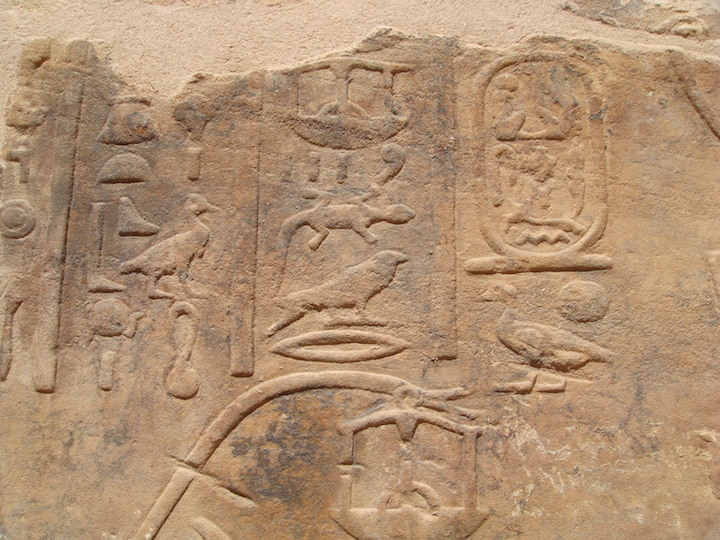 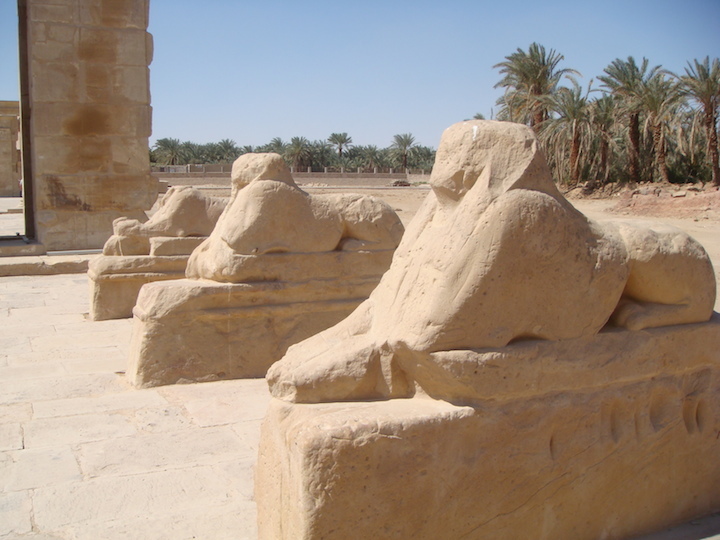 Hibis sits atop the site of an 18th dynasty settlement of Saites. 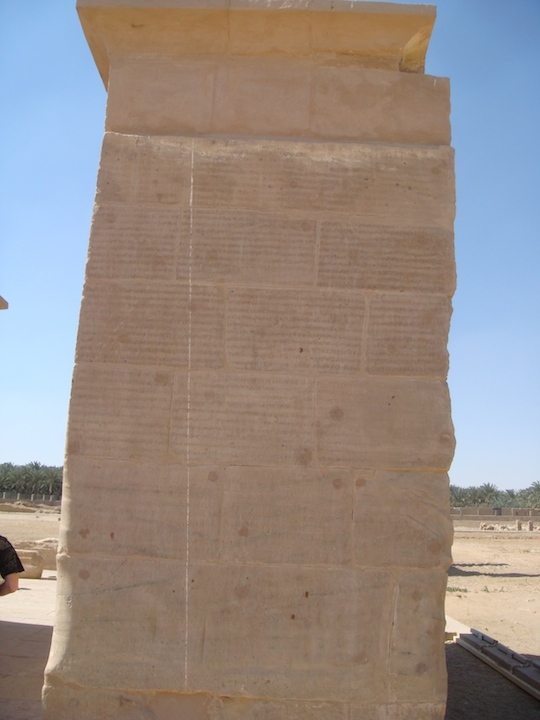 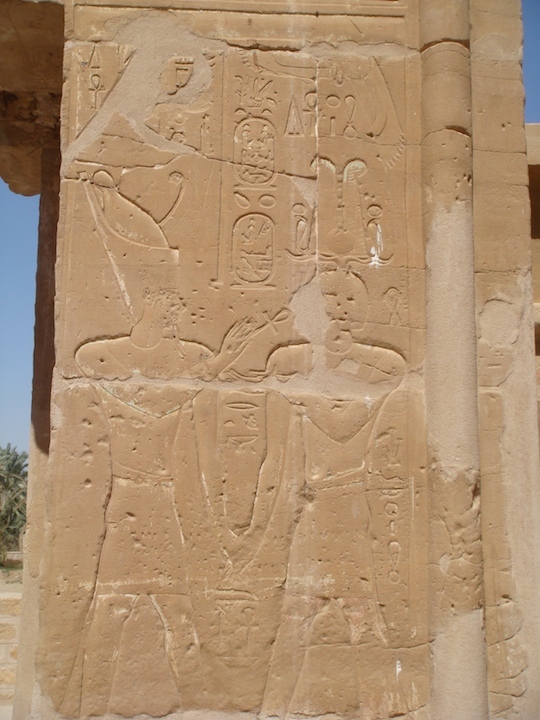 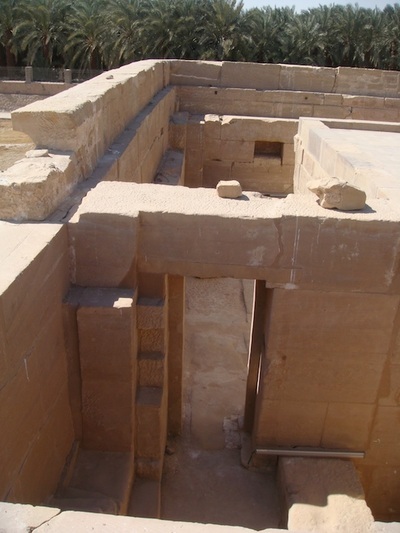 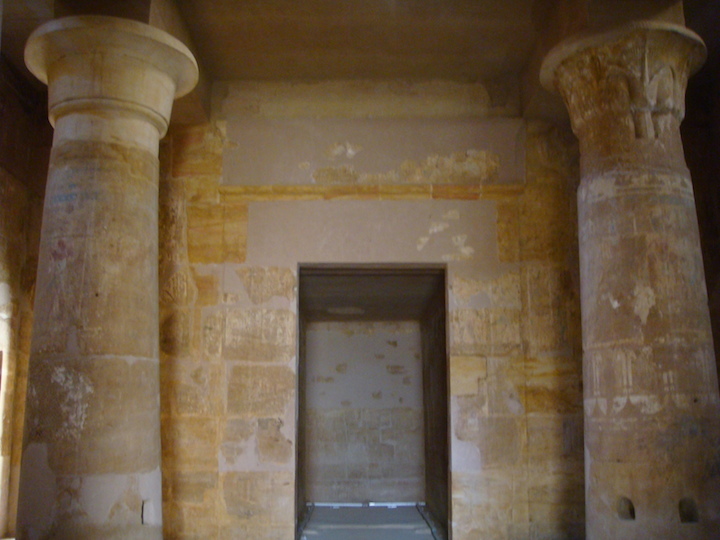 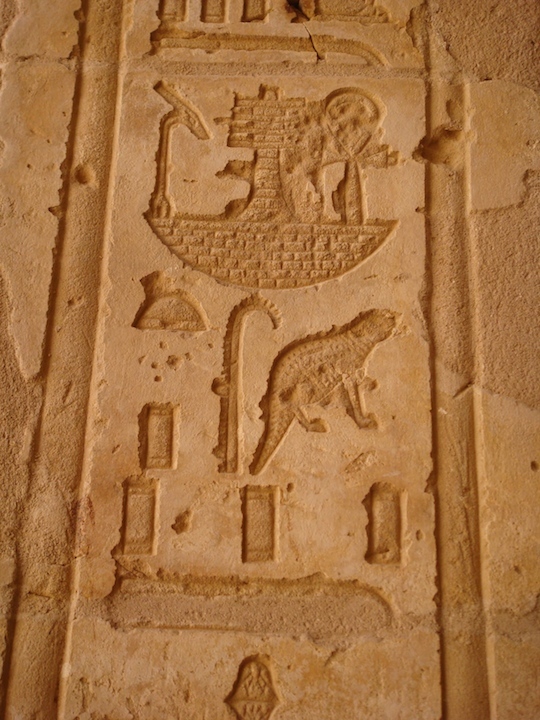 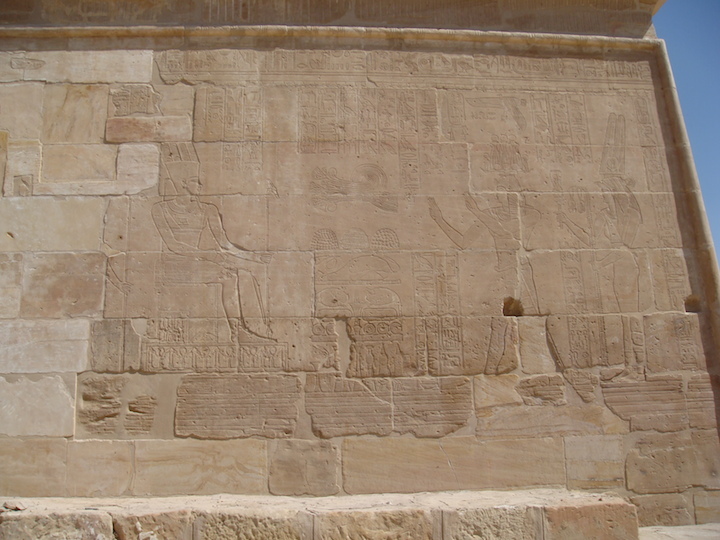 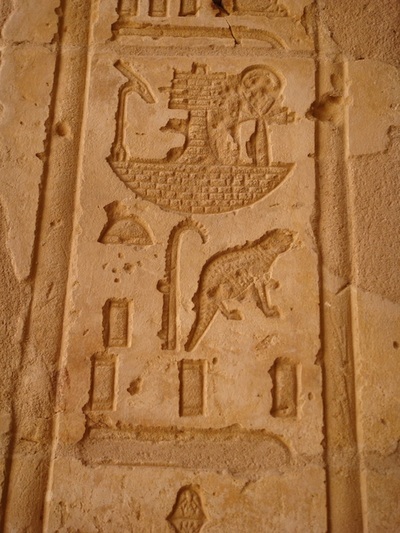 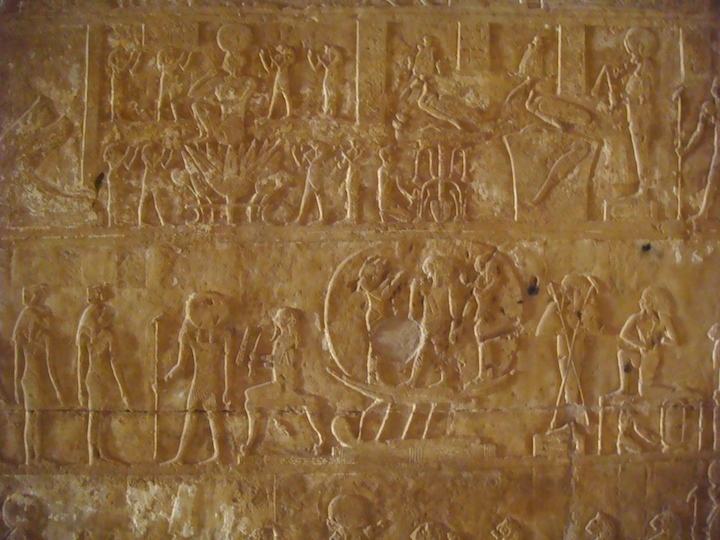 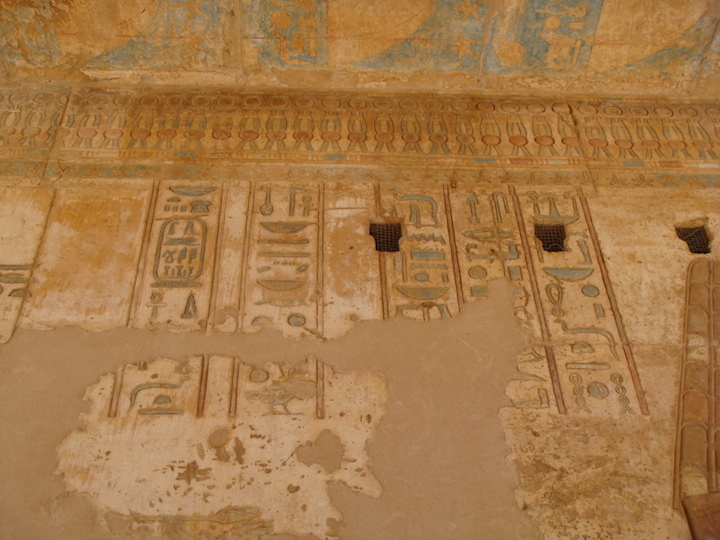 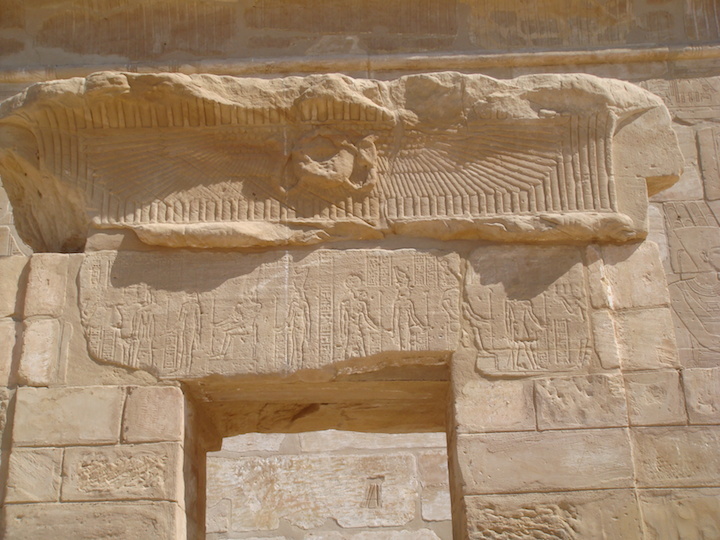 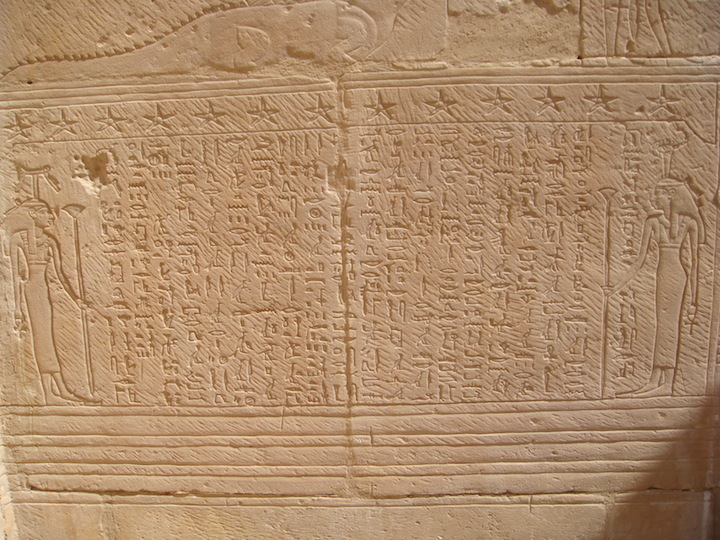 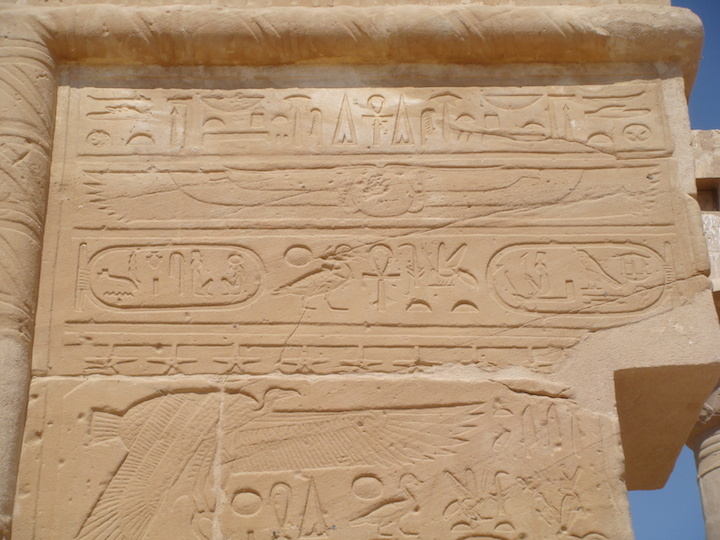 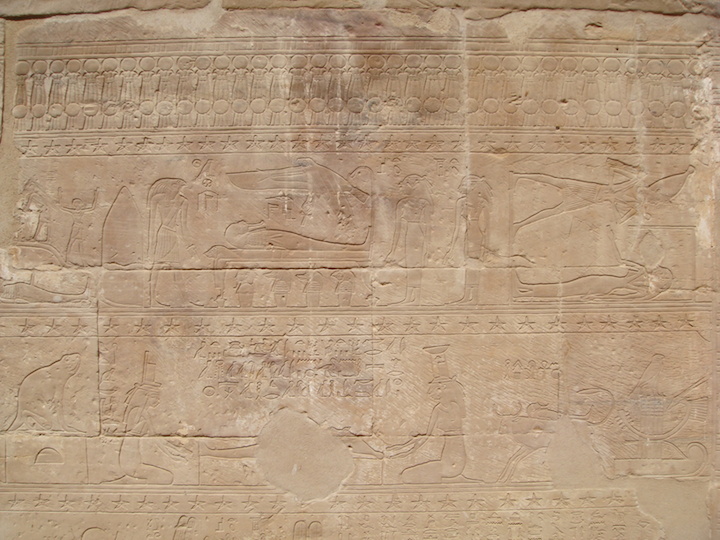 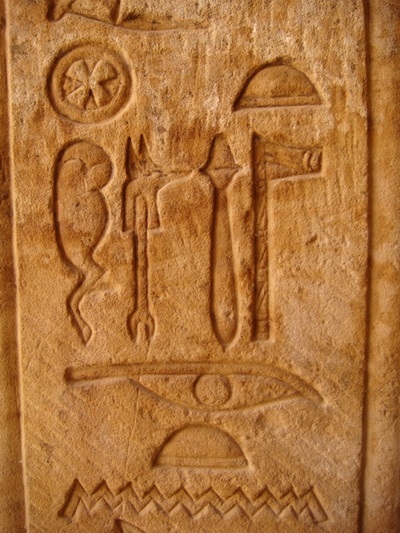 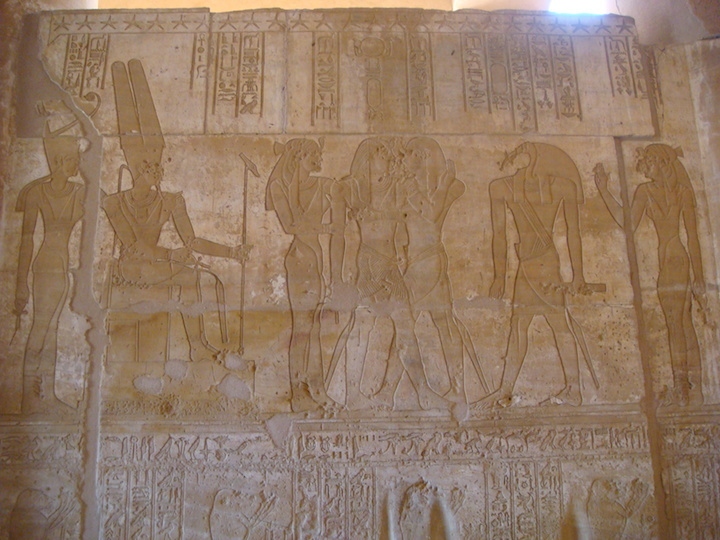 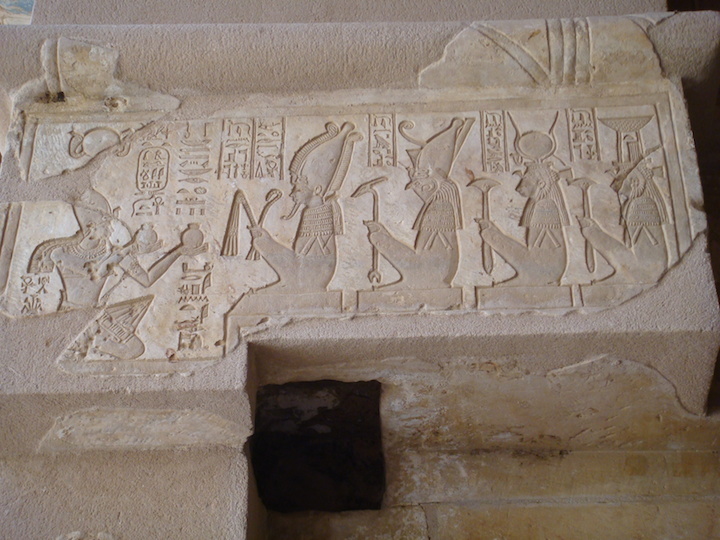 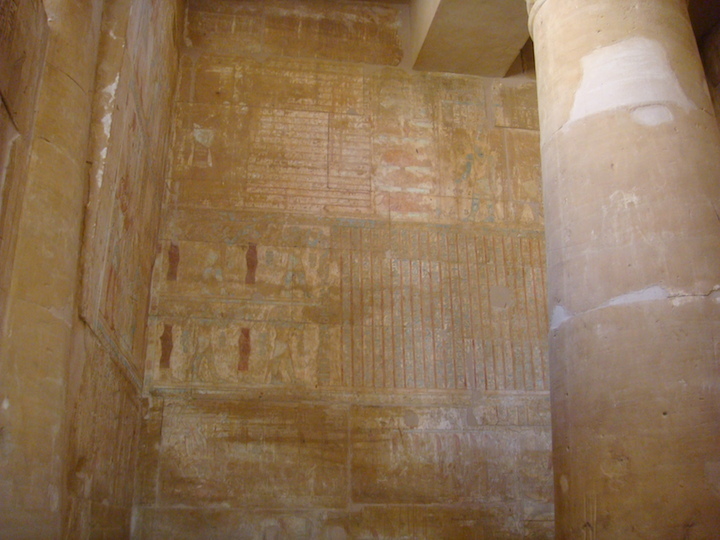 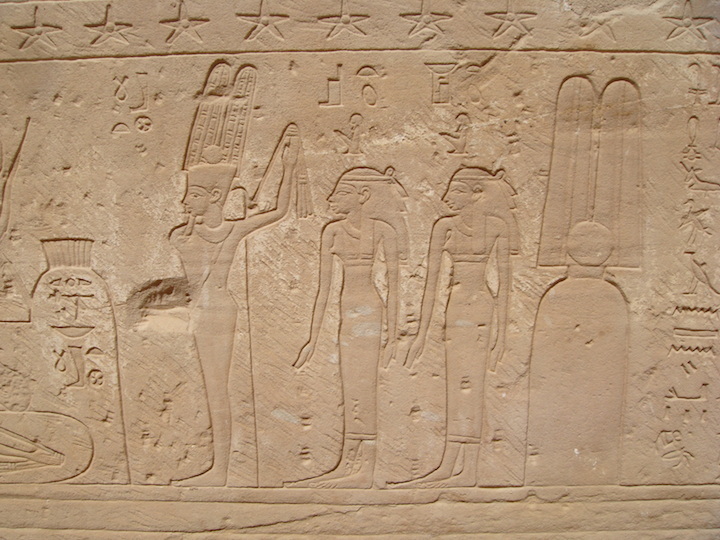 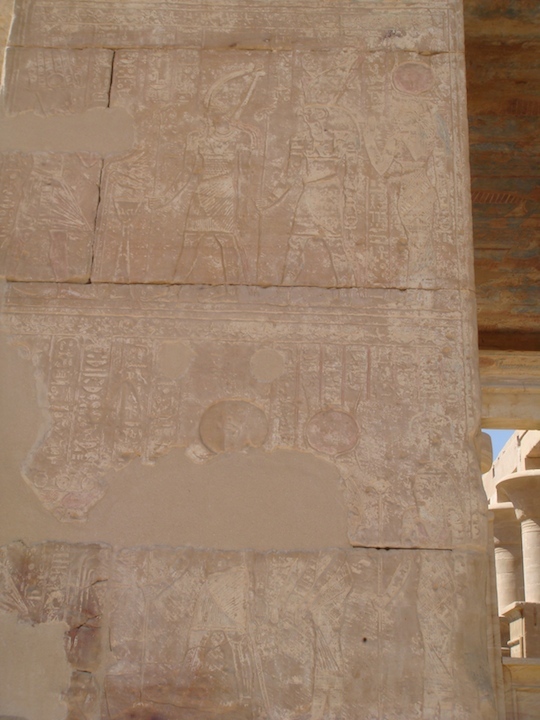 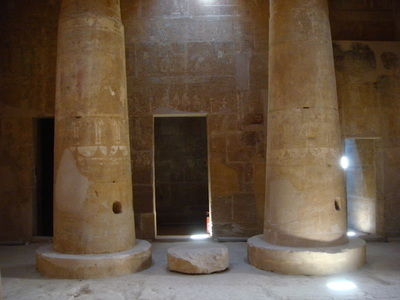 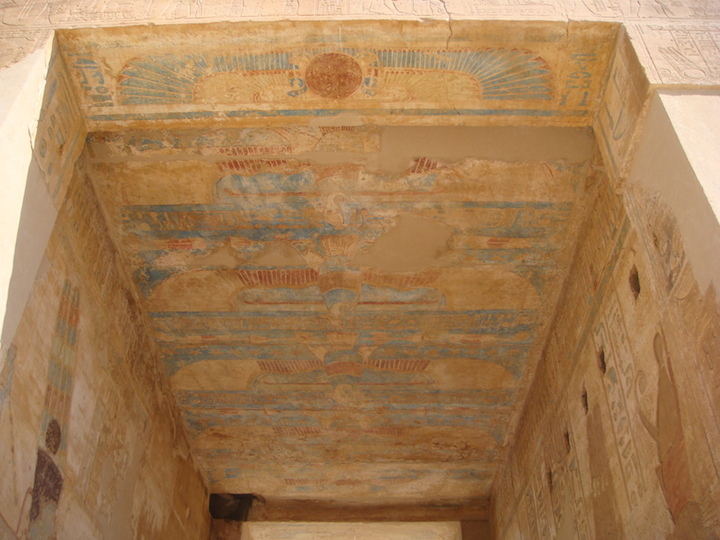 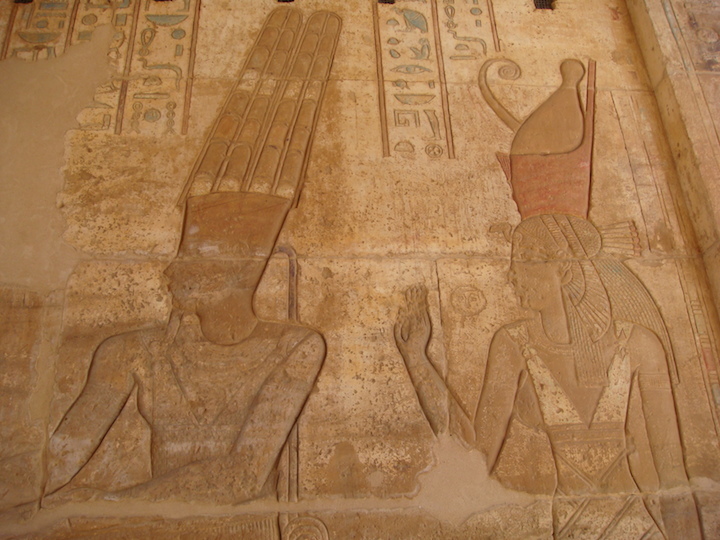 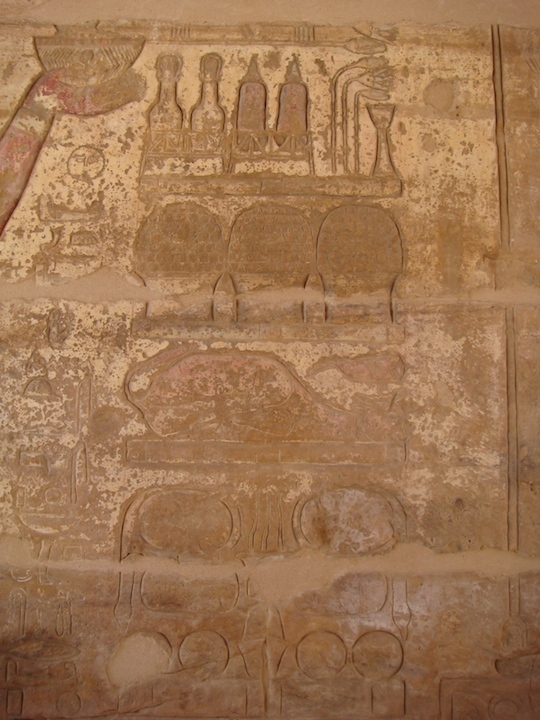 Hibis Temple build by Darius was dedicated to the Theban triad of Amun, Mut and Khonsu in their local manifestations as “Lords of Hibis” A number of scenes and inscriptions within Hibis Temple are unique and of considerable importance for understanding ancient Egyptian religion. 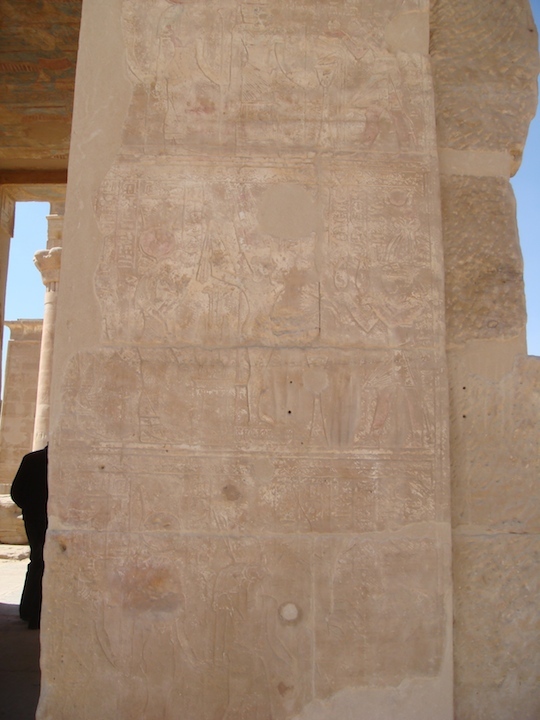 Outside of the temple, the propylon bears a Greek inscription of a Roman prefect dated to the short reign of the Emperor Galba (June 68 CE – January 69 CE). 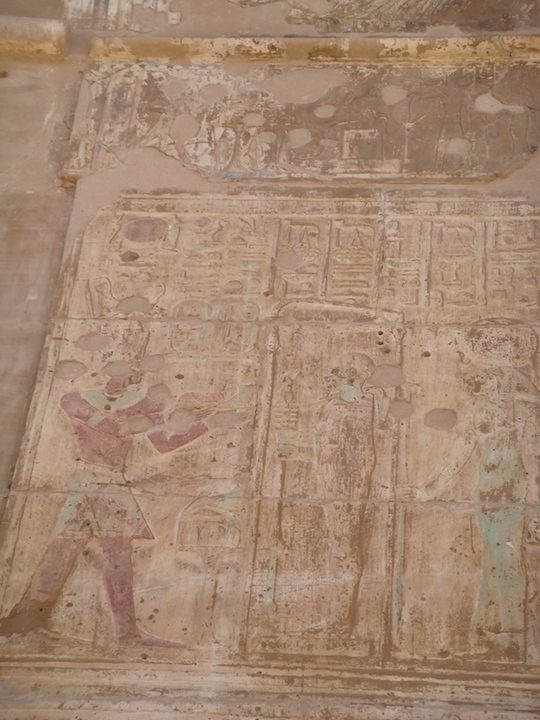 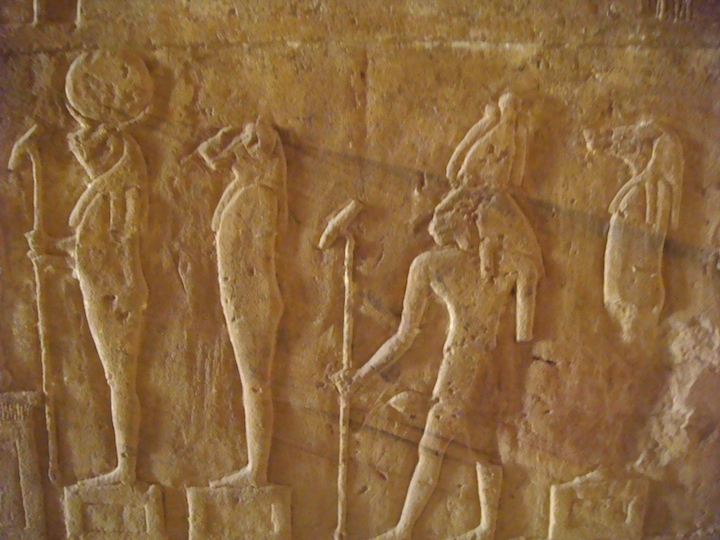 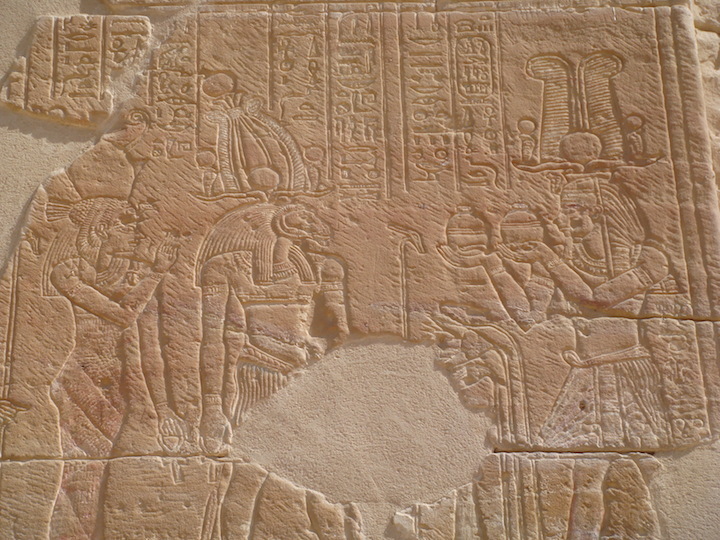 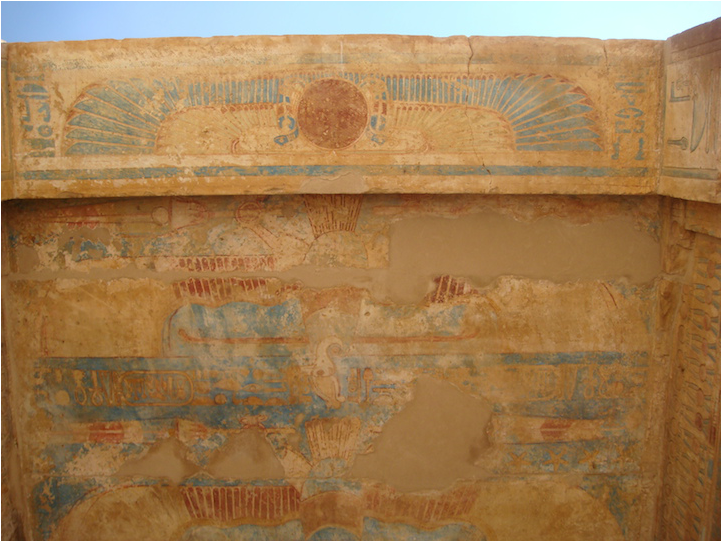 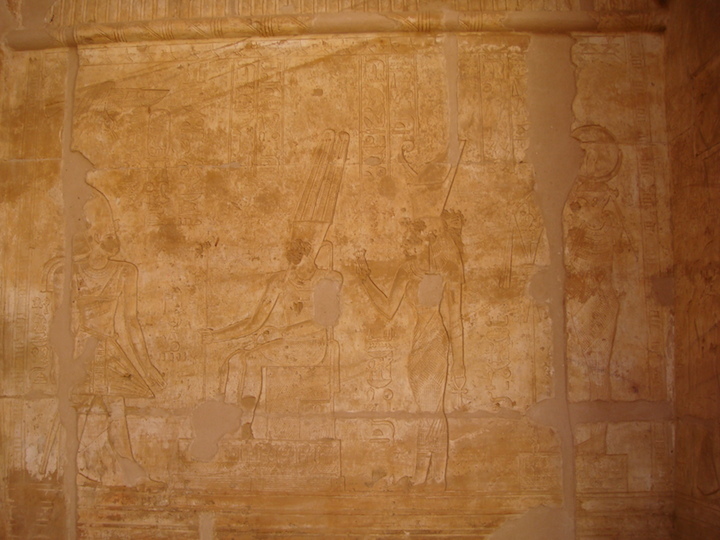 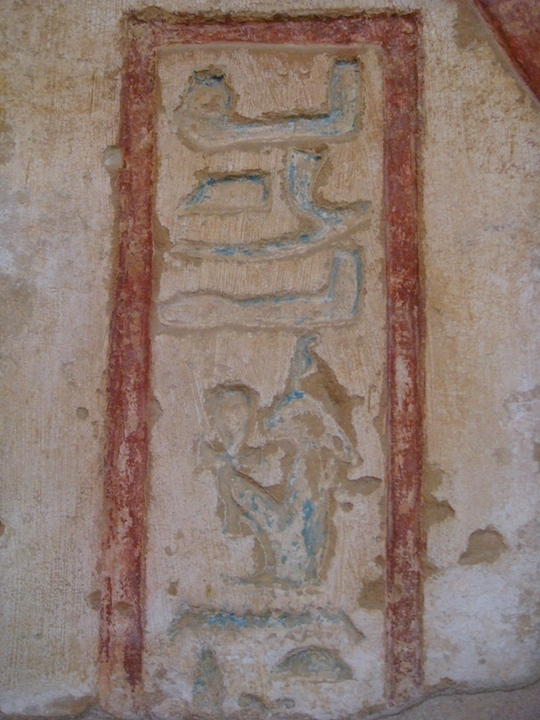 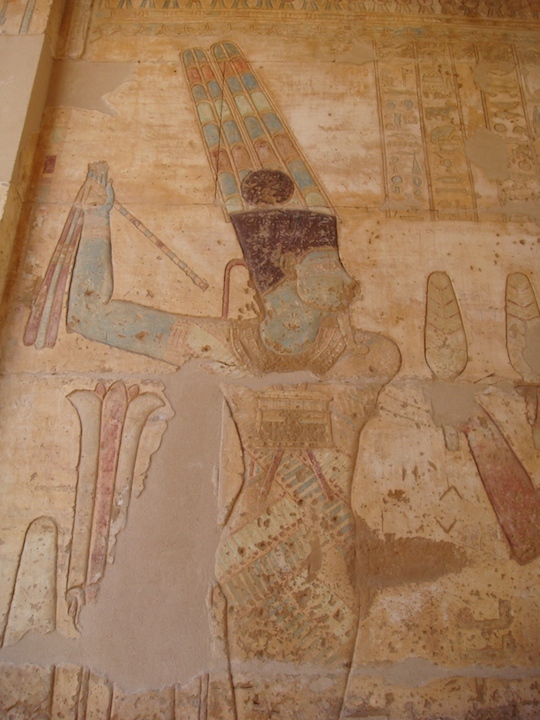 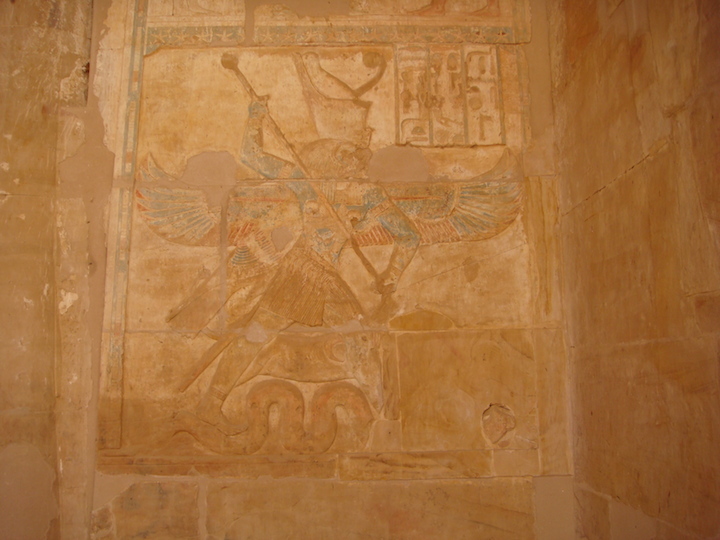 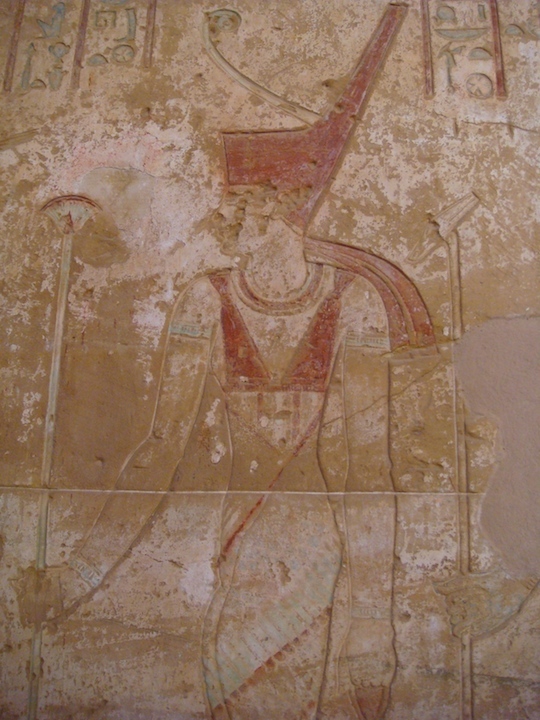 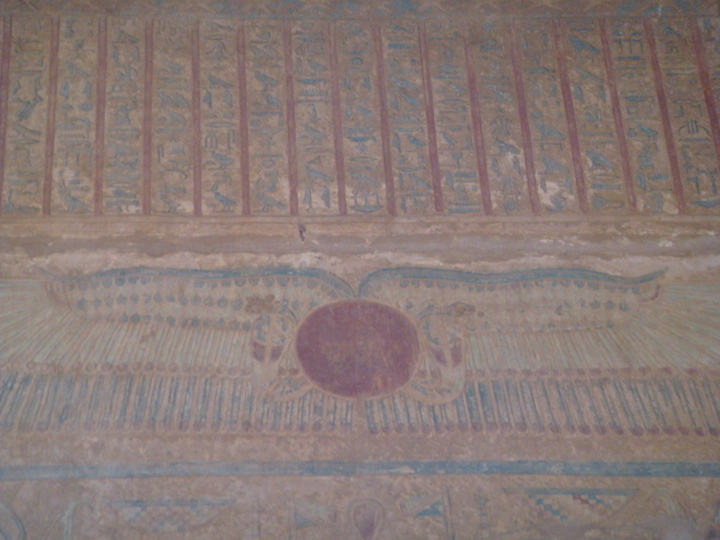 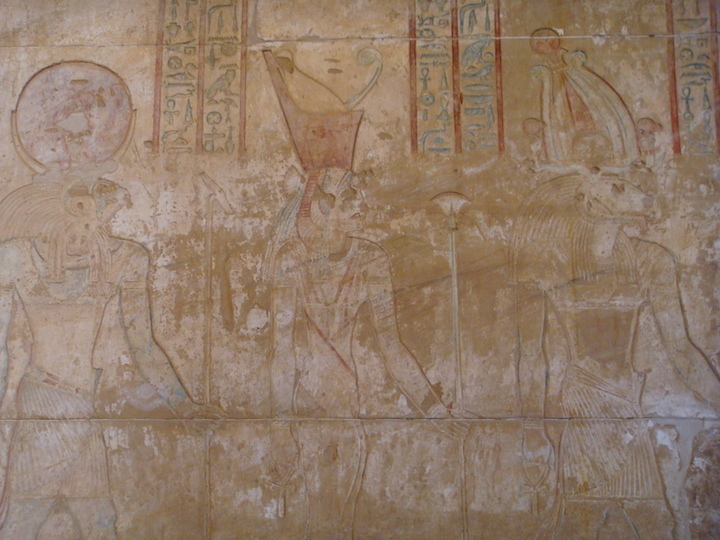 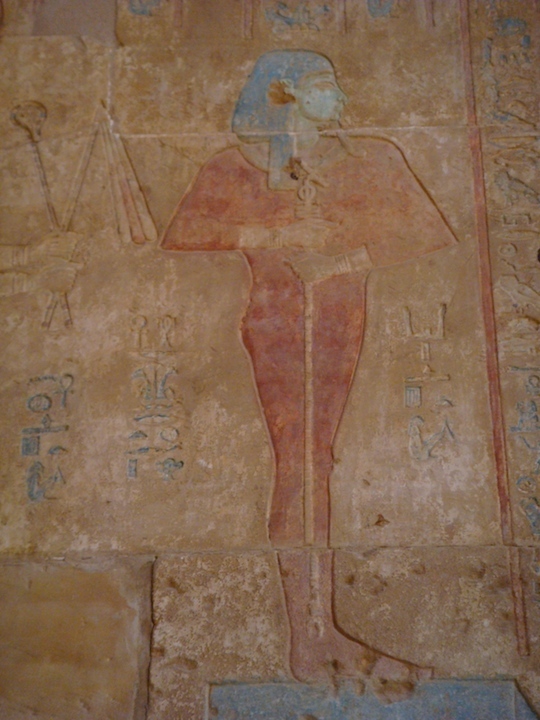 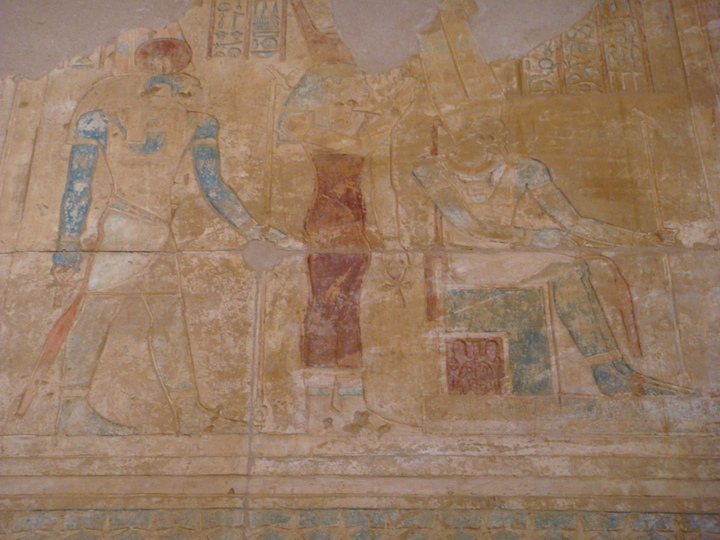 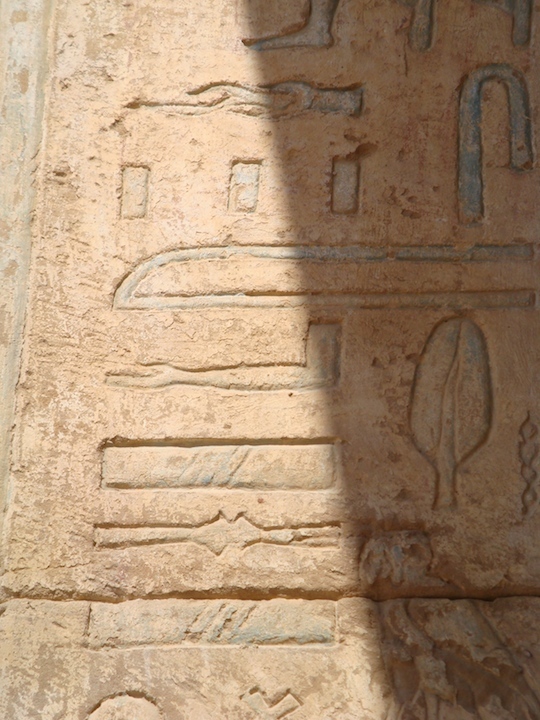 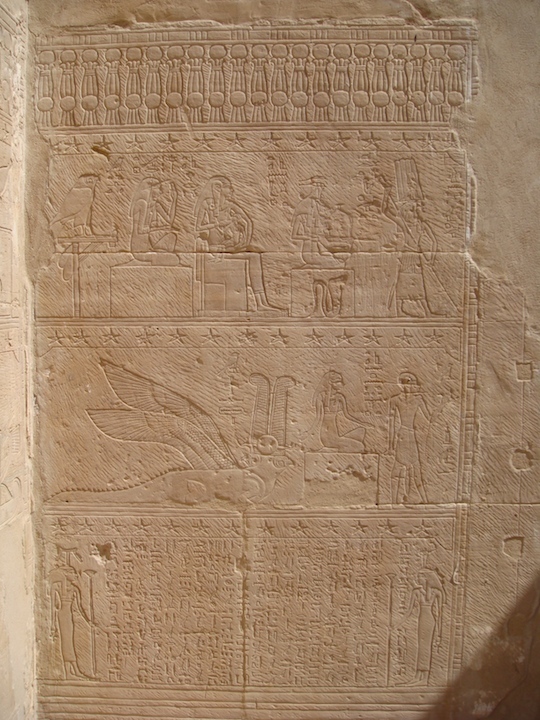 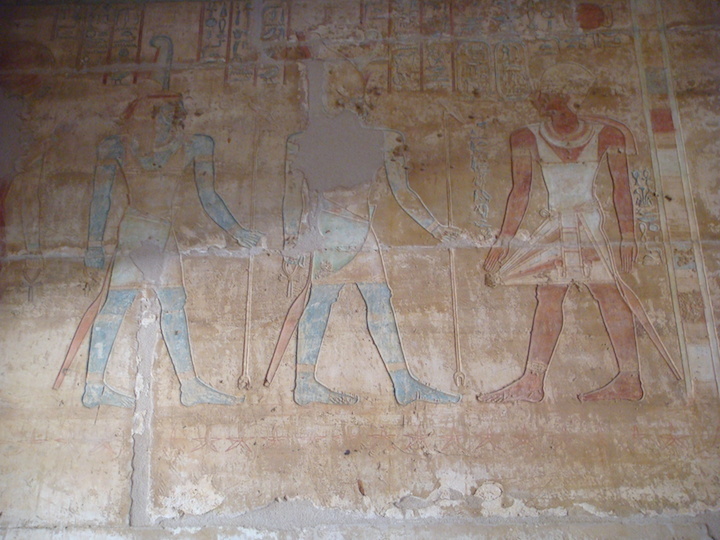 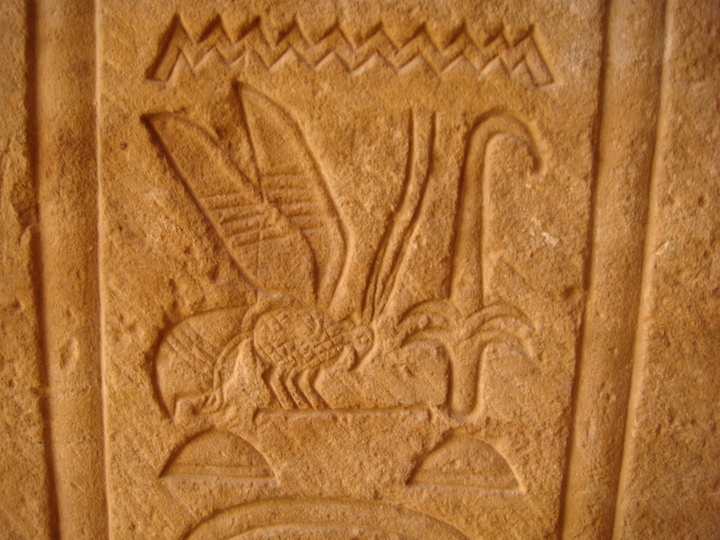 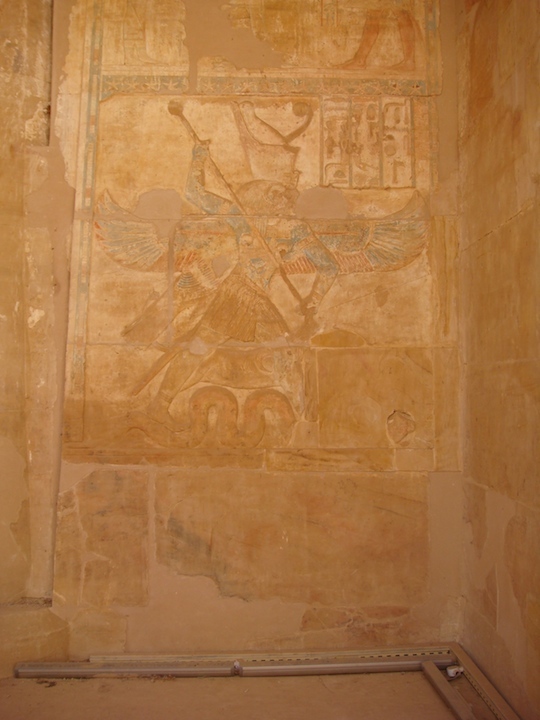 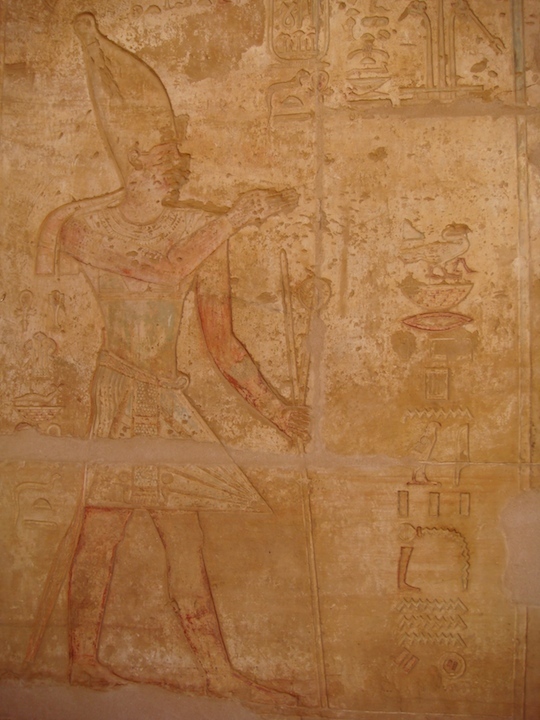 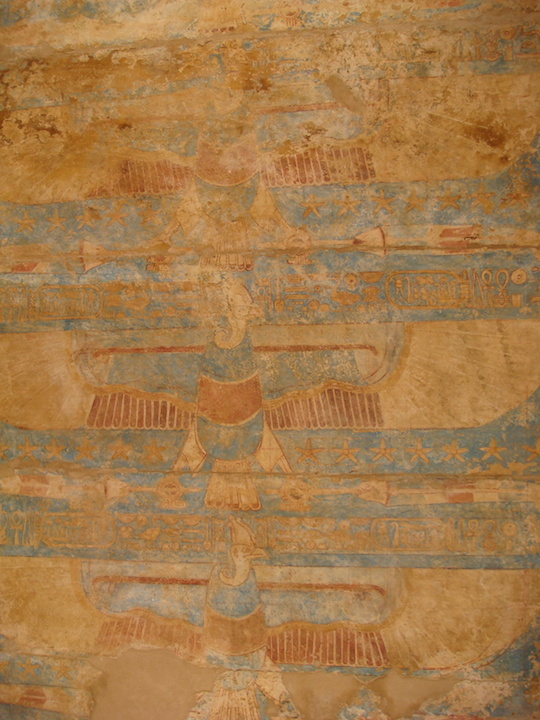 There is also a large wall relief of Seth, the God of the Oasis, with a blue body and the head of a falcon. 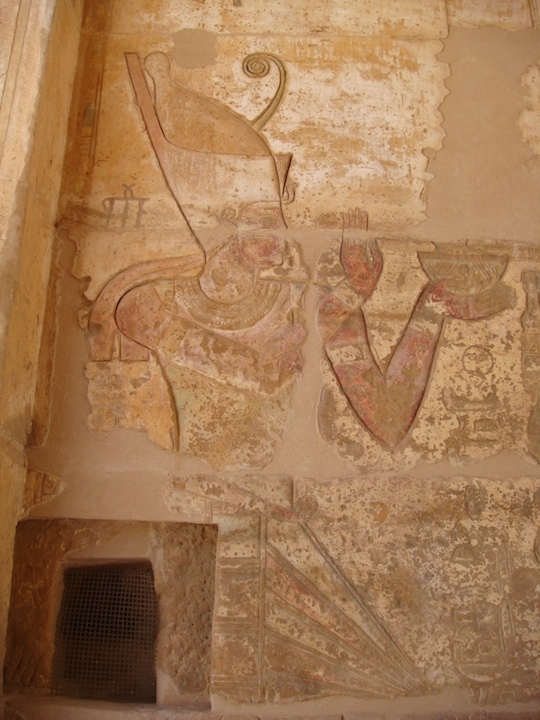 Here he is slaying a serpent with his spear. 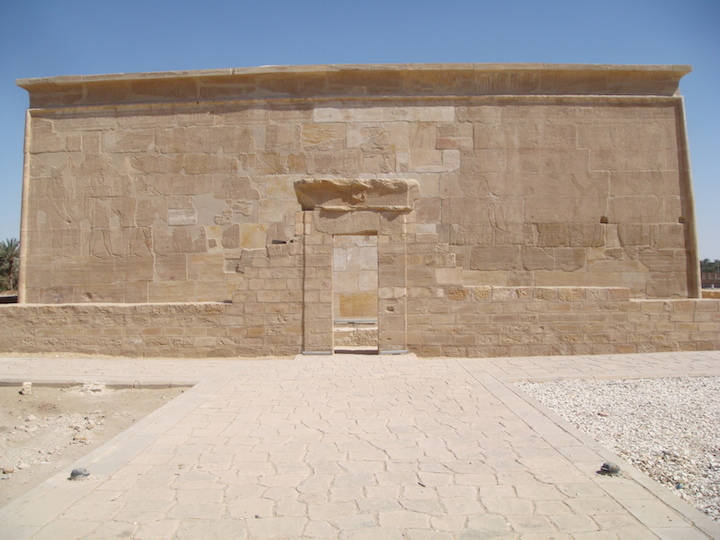 The temple as well as the fortress it was built within, dominates the desert road from the south by sitting on a volcanic outcropping. During ancient times, a lake that has now disappeared surrounded the temple. Little is known of the ancient town as much of it is buried beneath cultivated land. 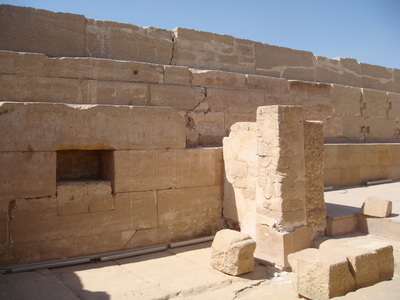 The temple was built from the speckled local limestone in an east/west orientation.